Turning the truly miserable blocks around New York City’s Penn Station into a pleasant and calming retreat would appear to be an impossible undertaking. But Vornado Realty Trust—the primary property owner around the station—believes it can do it with the help of some experienced, Norwegian architects. Enter: Snøhetta. 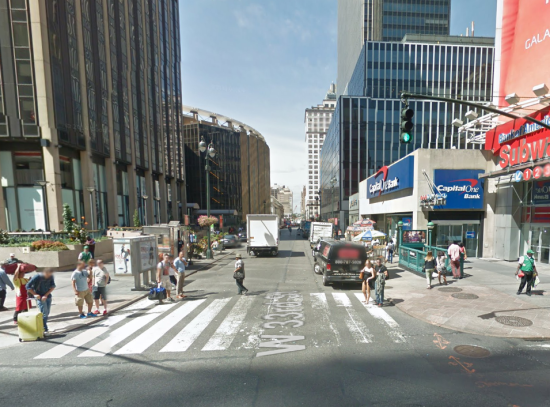 In June, it was reported that Vornado tapped the Oslo- and New York–based firm, which is also sprucing up the pedestrian environment around Times Square, to revamp its building stock in the area and generally improve the street-level experience around the station. 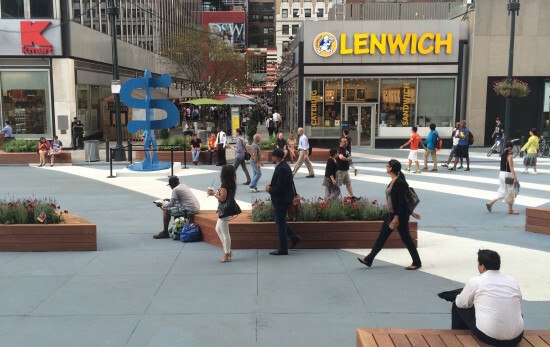 This undertaking would kick off with a temporary public plaza on a stretch of West 33rd Street, designed by W Architecture and Landscape Architecture. That plaza, called Plaza33, is now open, and to the designers’ credit, people seem to be really enjoying it. (Again, remember that it is right next to Penn Station, a notoriously overcrowded and people-unfriendly part of New York City). 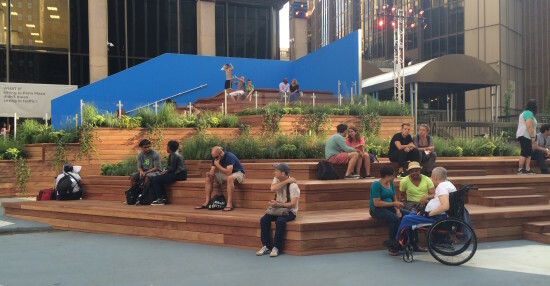 The plaza features a stepped, wooden amphitheater with overflowing planters. These materials are repeated with benches that also function as flower boxes. The roadway has been painted blue with diagonal stripes cutting across it. The plaza also features sculptures by Roy Lichtenstein and Keith Haring. The move is part of the popular Tactical Urbanism movement that encourages experimenting with public space—in this case temporarily shutting down a street—to figure out new ways to interact with cities. The concept holds up short-term actions as a generator of long-term change. Times Square, years ago, underwent similar temporary transformations leading up to its ongoing permanent redesign. Plaza33 will be used to host concerts, fitness workshops, movie screenings, and games. (A full lineup of events is here.) But all good things apparently must come to an end. The plaza will be disassembled on October 11th. But could we see a more permanent solution in coming years? New Yorkers will likely vote with their feet.